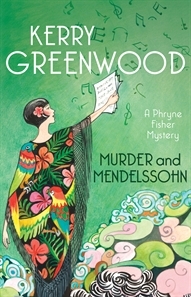 The divine and fearless Miss Phryne Fisher returns in her 20th adventure in a vastly entertaining tale of murder, spies, mathematics and music. At the same time, the dark curls, disdainful air and the lavender eyes of mathematician and code-breaker Rupert Sheffield are taking Melbourne by storm. They've certainly taken the heart of Phryne's old friend from the trenches of WW1, John Wilson. Phryne recognises Sheffield as a man who attracts danger and is determined to protect John from harm. A vastly entertaining tale of murder, spies, mathematics and music.